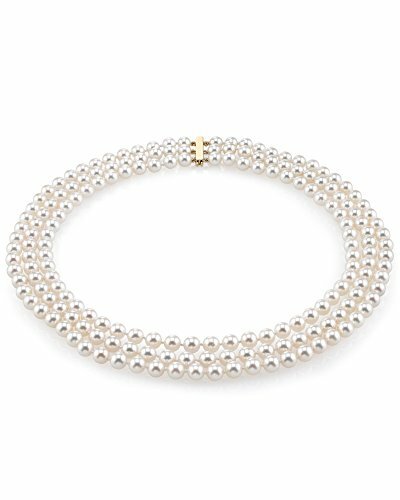 This beautiful White Akoya triple strand pearl necklace ranges between 5.5-6.0mm and 7.0-7.5 in size and consists of all beautiful and lustrous pearls in AAA quality. All pearls in this necklace are perfectly round and are strung with silk thread and double-knotted between each pearl. This necklace comes standard with a beautiful 14K gold clasp, with the choice of either white or yellow gold. Additional necklace lengths may be selected above to create the perfect piece of pearl jewelry. All of our pearl products are shipped in an elegant jewelry box that truly makes a remarkable presentation. Known as the "icon" of cultured pearls, Akoya pearls have graced the necks, ears, fingers, and wrists of women for decades. The Akoya pearls from the salt waters of Japan are grown in the Pinctada fucata oyster. All of our Akoya pearl necklaces are made on site, and our extensive experience and careful attention to detail allows us to create truly beautiful Akoya pearl necklaces. The strands are 16", 17" & 18" in length.